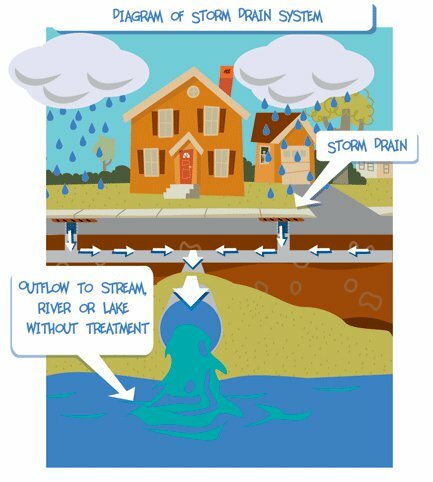 Stormwater Management Info – be an H2O Hero! See links below for more information, including the Monroe County Stormwater Coalition's annual report, tips for preventing stormwater pollution, green infrastructure in your home, and living next to stormwater management ponds and wetlands. Stormwater pollution is the sediment, bacteria, fertilizers, pesticides, automotive fluids, and other materials that are washed from surfaces such as parking lots, roads, roofs, and construction sites during a rain storm or snow melt. The gutters, storm drains, pipes, ditches, and outfalls that comprise the stormwater system transport these pollutants to the nearest waterway. The Town of Pittsford is committed to minimizing stormwater pollution and discharging stormwater in accordance with the NYSDEC SPEDES general permit. The Town of Pittsford has developed and maintains a Stormwater Management Plan (SWMP) in the pursuit to keep stormwater clean. The SWMP consists of six minimum control measures: public education, public participation, control of illicit discharges, erosion control at construction sites, post-construction stormwater treatment, and pollution prevention at municipal facilities. The Town works with the Monroe County Stormwater Coalition to develop educational programs, offer and provide training to Town employees, and ensure Pittsford has the tools needed to keep stormwater and waterbodies clean.